Northumberland has a growing reputation for year round mountain biking with some excellent specialist trails for all abilities such as Kielder Water & Forest Park which has an extensive network of off-road trails, as well as the family friendly Lakeside Way – a 26 mile trail that encircles the shoreline of Kielder Water. These facilities were one of the reasons Kielder Water & Forest Park was voted 'best tourism experience' at the 2013 Visit England awards. 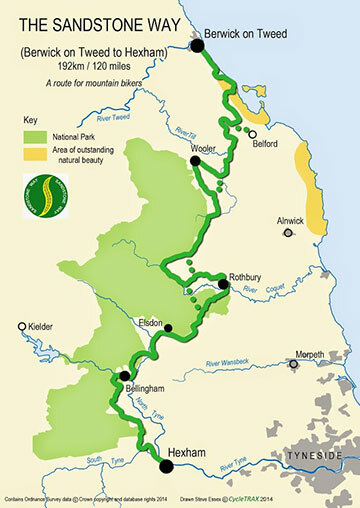 Northumberland is also host to superb classic mountain bike routes in particular in Northumberland National Park. One thing you can count on – which ever route or route combination you choose, you will find an amazing mix of varied and continually changing landscapes and countryside which will set the scene for a truly memorable two wheeled journey of discovery. The Sandstone Way is a fantastic new 120 mile mountain biking route between Berwick-upon-Tweed and Hexham that runs along the Sandstone Ridge through the heart of North Northumberland. Linking numerous sandstone features, crags and outcrops, the route links the Northumberland Coast Area of Outstanding National Beauty with Northumberland National Park, making it one of the most scenic rides in England. Primarily aimed at mountain bikers, as much of the route as possible is off-road and the route safely crosses rivers, four main roads and two railway lines giving a constant flow. Featuring a varied terrain, it takes advantage of an interesting mix of double-width dirt tracks, sections of single-track, un-surfaced lanes and bridleways of all types. each an ideal place to pause and take refreshment. wish to cycle back to their starting point. Accessible to all abilities, from families and less experienced mountain bikers, to those at intermediate standard and fit competent mountain bikers, this new cycle route is certainly one to add to your list! Available from www.cyclepad.org.uk, or local tourist information centres.